Remember this posting on here a few weeks ago about a forthcoming dolls house event in Jersey? Well I am delighted to have been sent photos and feedback from the Jersey Dolls House & Miniatures Club, as apparently the event was a wonderful success with over £700 raised for two charities - Autism Jersey and SCBU (a charity for premature babies). Seeing as the club is made up of just 15 members, that is quite an achievement! Club member Barbara Kendall-Davies tells me that her interview on BBC Radio Jersey and subsequent daily mentions of the event on the radio, plus additional publicity in the local Jersey media, helped to bring a steady stream of visitors all day. As well as a display of club member's creations and own dolls houses, shops, etc., there were various fund raising attractions including a tombola and raffle. The first prize in the raffle of a lovely fully equipped miniature kitchen room box made by club secretary Susan Deans, was won by a young woman who has just caught the dolls house bug... (ha ha - fellow miniaturists out there will recognise that "dolls house bug" I'm sure)! Barbara goes on to say that the theme of this year's exhibition was Inside/Out and members produced some very novel models. Below you can see some of them. One of the most popular models made under the Inside/Out theme, was Pauline Falla's Organics, showing a shop and produce on the pavement outside. Beverly Lelai charmed everyone with her Japanese Zen Garden And Tea House. It was truly authentic even though she has never been to Japan. Gwyneth Morgan's Fairy House And Garden was a great favourite with the children. Congratulations to the Jersey Dolls House & Miniatures Club for raising money for charity in such a wonderful way, and thank you for sharing photos of your lovely creations with us. I am delighted to announce that Part Two of an amazing Grecon Doll Collection is now up for sale at long last! The majority of the 75 Grecon dolls have had some repair or damage, and they have been priced accordingly. 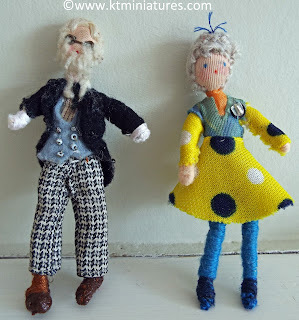 If you are a great fan of Grecon dolls and you are also clever with a needle and cotton, there are some super bargains to be had and it is a great opportunity to boost your Grecon doll collection. 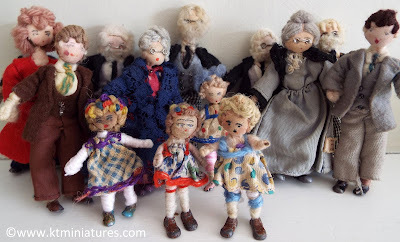 I had hoped to have had these up for sale by the beginning of this week but due to the sheer volume of dolls, it took many more hours of photographing, observing, measuring, researching, etc. than I had originally anticipated! 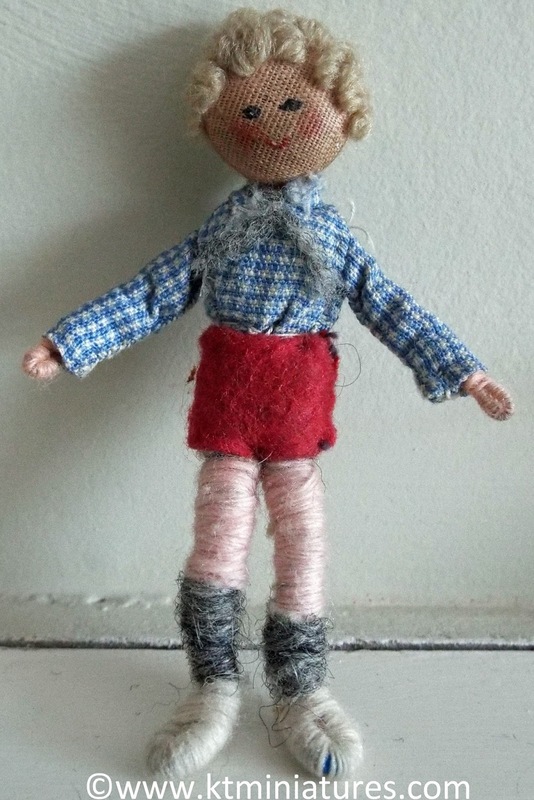 Some have been cleverly repaired, such as this c1930s/40s Grecon doll with a material covered button head. 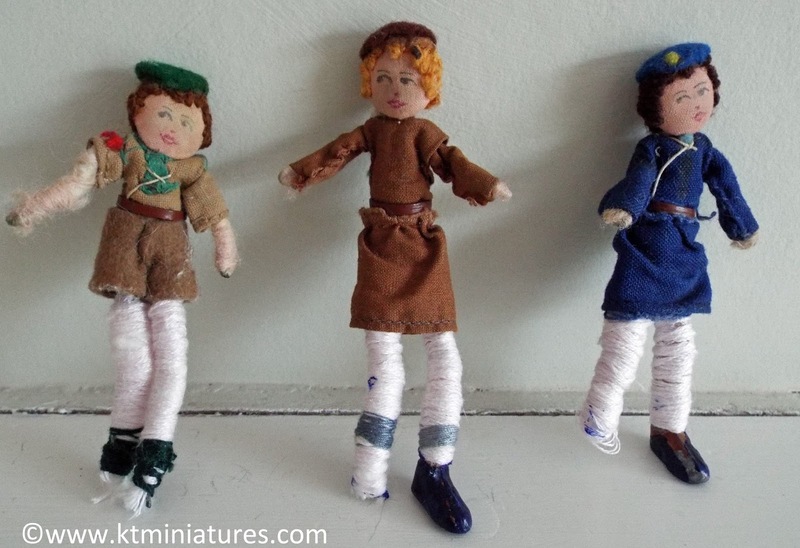 His original legs and feet are long gone, but someone has beautifully created him new legs and the illusion of feet by covering the end wires with a different colour wool. I had at first wondered if he was a Tomac doll (you can see some further down this post) who were always made with button heads, as I had always assumed that all Grecon dolls had stuffed material heads...even the pre-war versions. But his drawn on facial features were not quite like the usual Tomac facial features (they traditionally have an open mouth and eyes looking to the side)...so I was well and truly baffled. 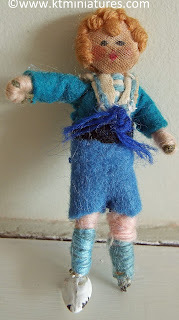 And then as I had begun to photograph all the dolls, I realised that this little boy with a Grecon lead melon foot (melon feet were believed to have been used on the early c1930s/40s Grecon dolls) was of the exact same construction ie. button head, plus his facial features were almost identical. 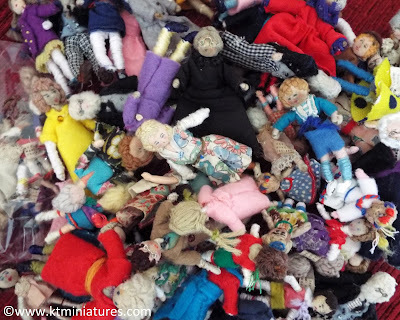 A quick email to a KT Miniatures' customer who has a vast collection of Grecons, confirmed that she too had some early Grecon dolls with button heads. So there you go... I have learnt something new! Then there are these vintage Grecon dolls who had lost both feet but who had cleverly been given new legs and feet. However the feet have been created in two different ways. The Grecon Grandpa had the end of his woollen bound feet painted in brown paint to create the illusion of shoes. The later Grecon doll (don't you just love her bright c1970s/80s dress), has had the end of her legs bound in a darker blue thread than her leg binding, to create the illusion of shoes. Very clever! Just goes to show how you can bring new life to damaged dolls and make them quite acceptable once again to be used in your old dolls house. There are some vintage Tomac dolls too available with this collection, all in uniform...as you can see above. Ok, they may have lost a foot or two and been given replacment legs but the Tomac Brownie, Girl Guide and Cub Scout dolls are so rare to find these days, that I am quite sure that someone out there will want to give this lad and two lasses a new home. 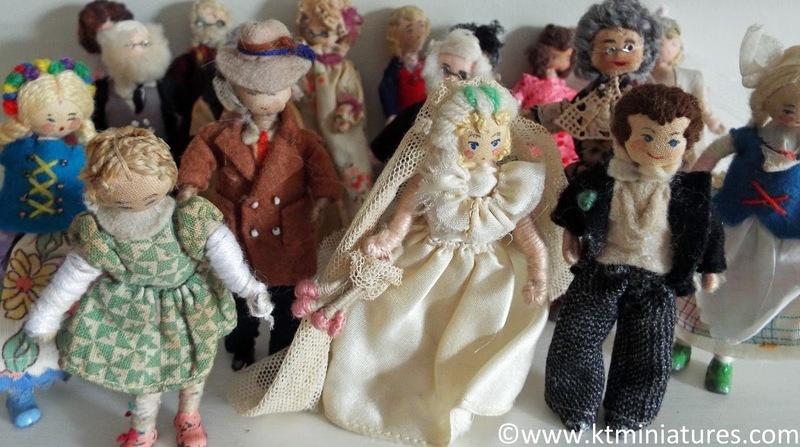 This particular collection belonged to a lady who had been collecting Grecon dolls since her childhood in the 1950s, culminating in a much loved collection of over 150 dolls. It is now her family's wish that these little dolls go to new homes where they will continue to be appreciated and cherished. Due to the sheer volume of dolls, I decided to split the collection into two parts. Part One went up for sale last week and mostly included the dolls that were either in excellent conditon or a good condition.As mentioned above, Part Two includes all the other dolls - some are in reasonable condition and others are repaired or damaged in some way. But every single one needs a home. There are still 14 dolls up for sale in the first part of the Grecon collection (seen above), most of these are in a relatively good condition and have been priced accordingly. As long as there is no RESERVE or SOLD sign next to the doll listing, it should be available. Why not take a peek and see if you would like to take on one of these lovelies and give them a new home. A large collection of vintage Grecon dolls have arrived here at KT Miniatures and I am delighted to announce that the first half of the collection has just gone up for sale on KT Miniatures website today. Business has been brisk and many were sold in the first hour of listing, but there are still quite a few left. To date, this is the largest Grecon doll collection I have taken on and opportunities like this for the serious doll collector just do not come along very often. 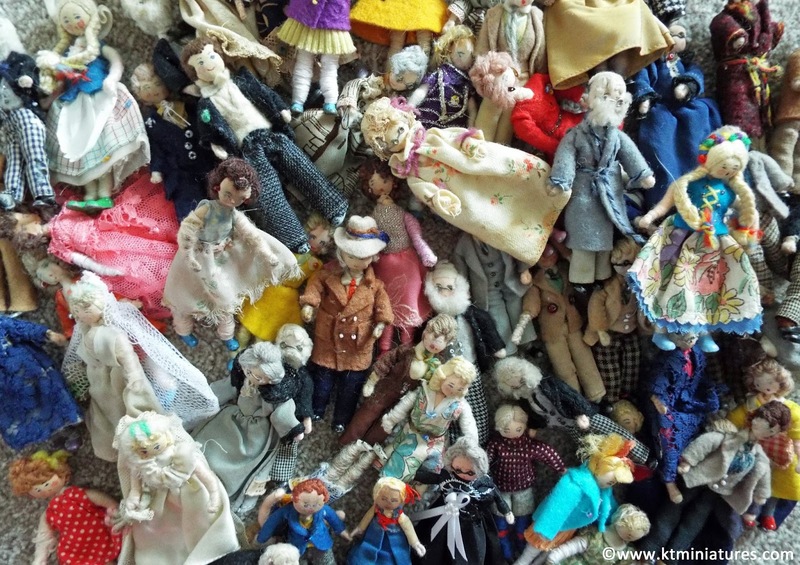 This particular collection belonged to a lady who had been collecting Grecon dolls since her childhood in the 1950s, culminating in a much loved collection of over 150 dolls. It is now her family's wish that these little dolls go to new homes where they will continue to be appreciated and cherished. Some of the special Grecon dolls that have gone up for sale today. 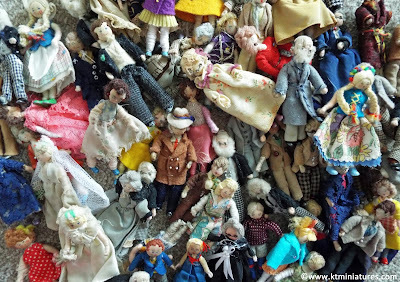 I am splitting the collection into two...the first part of the collection consists of around 70 dolls, all of which are in a reasonably good condition - one or two are quite special, and it is those that I have put up for sale today, some of which you can see in the photo above. Then in a few days time I will put up for sale the second part of this collection which will feature all the other Grecon dolls and there are one heck of a lot of them! Some have minor damage, some have been repaired, then there are some that have major damage and missing a limb or two! Some of the damaged and repaired Grecon dolls that will be available in the second part of the Grecon Collection in a few days time. In fact some are downright dilapidated and some even a little whacky but which could be used for "spares". These would be ideal for the enthusiast who loves rescuing old Grecons and breathing new life into them. There will be some bargains to be had.